Pondicherry fun guide to boutique hotels, colonial stays, shopping, yoga and ashrams, by Peter Morgan, and more from Smart Travel Asia and Dancing Wolf Media. 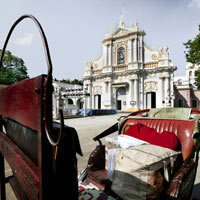 For a hint of France and charming boutique hotels in spiffy colonial mansions, our Pondicherry fun guide reveals all. Head off to South India. MOST cities do their best to woo visitors, but not the former French colony of Pondicherry. The South Indian city’s marketing slogan “Give Time a Break” could be interpreted as “Give us a Miss”. Yes, there was a new airport by mid 2014, but no flights. And, well yes, there is a broad-gauge railway connection, but the train from Mumbai takes over 33 hours and makes 36 stops en route. Instead, everyone grabs a taxi in Chennai (less than Rs3,000 each way) to make the three-hour drive along a bumpy coastal highway that dips in and out of the Bay of Bengal. The good news is that inaccessibility has allowed Pondicherry to remain one of those “charming proverbial backwaters” you always read about, but never seem to be able to find. Much of the city’s French colonial past remains miraculously intact and the city boasts the best collection of colonial French heritage buildings in the world. Not surprising, it is also home to a large expatriate community. To stroll the small streets in the French Quarter or La Ville Blanche has a wonderful end-of-the earth feeling to it. You’ll take in tile roofs, elegant colonnades and herds of French school children rushing out of the local lycee (school) calling “Mère ici!” (“I’m over here!”). The local policemen wear red kepi (French-style pillbox hats), the streets are called rues and old men play boules in the shade of the banyan trees. The whole experience will leave you wondering if you have been magically transported out of India and into a small village in Languedoc-Roussillon. By way of explanation, the guidebooks tell you that the French established this port town on the Bay of Bengal in 1674 as a stopover for French traders on the way to more important markets in Indochina. Over the centuries the town was caught in a colonial ping-pong match changing hands between the French, Dutch and British with the French coming out victorious in the battle of ownership. After years as a stagnant outpost it rejoined India in 1956. These days, Puducherry, as it has been renamed but rarely called, is the kind of place that gets under your skin and lulls you into a chilled-out submission. “Pondi offers the opportunity to take a break from the craziness and challenges of India. It’s a walkable city unlike almost any other and is manageable without overwhelming crowds, noise, or traffic,” says Kasha Vande, the American Coordinator at the government supported Pondy ART foundation. It’s best to explore the city in the morning. You’ll see the neatly pressed children being dropped off at schools; sari-clad sweepers dusting off the remains of the night and fresh produce being delivered to the hotels and restaurants. Lazy yellow morning light filters through the branches of overhanging trees highlighting commuters scurrying to work. The city hasn’t totally slept through its past 50 plus years. It made a debut in Ang Lee’s film Life Of Pi (The zoo scenes were shot in Pondicherry’s Botanical Gardens) and in 2009 Christian Dior launched “Escale a Pondichery”, an eau de cologne with a scent of jasmine, dark tea, sandalwood and cardamom. Fashion brand Louis Vuitton like the city so much they established their only manufacturing facility in Asia in Pondi (it was sold in 2011 following labour problems) and more recently, celebrities such as designer Lulu Guinness and pop diva Marianne Faithful have been seen poking around the small shops. While Pondicherry is far from becoming the next Miami, it attracts a mad hatter’s mix of colourful travellers and residents. The guest list at a birthday party I attended for a visiting architect for example, included two Icelanders, a Canadian journalist, an Italian photographer, two American aid workers, a French hotelier, a brand merchandiser from Delhi and a gentlemen of undeclared origin who claimed, in a toffee-nosed tone, to have a law degree from a prestigious UK university. “Pondicherry could be, and should be, the Saint Tropez of India”, says long-time French-expatriate resident Dominique Heil. “All it needs is a few nice bars open late at night and a marketing programme that targets young Indians who have a global outlook and move easily between Indian and Occidental cultures.” Here's our guide to fun and boutiquer beds in Pondicherry. Local entrepreneurs have taken note and the French Quarter now boasts a clutch of tasteful small hotels, galleries, bistros and boutiques that rival the best anywhere in Asia. Most of the new additions have slipped into sensitively restored old French-era mansions. 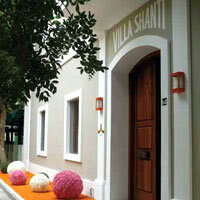 The elegant Villa Shanti on Rue Suffren is a recent example. The tres chic small hotel mixes tones of grey and white with dazzling Bollywood paintings in an international décor that looks as if it’s been plucked from the pages of Designer Hotels of the World. Rooms face a central courtyard restaurant and bar. Like many new businesses in the city, the hotel is the offspring of a multinational marriage of a French interior architect, Delhi owners and guests from just about everywhere in between. Thamimul Ansari who works at the Keys hotel in Chennai, says Pondicherry is developing into a niche destination for travellers seeking a cultural and historical travel experience. “A lot of small art décor, boutique are in the pipeline which will evolve Pondicherry as place of art and architecture,” he says. Nearby Les Hibiscus hotel offers large rooms overflowing with antiques and bric-a-brac, red marble floors and whirling overhead fans giving this small hotel a true hotel-du-charme ambience. It is reasonably priced, well located and has complimentary WiFi. 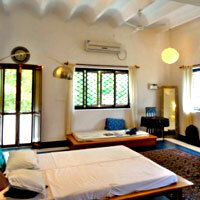 Gratitude is a delightful eight-room hotel housed in a French colonial villa that was used as a set in Life of Pi. The property has been lovingly renovated in cooperation with an India government heritage group and offers free WiFi, but no television and is not child friendly. Overlooking the Bay of Bengal, the five-star Promenade is a child-friendly hotel with a fabulous rooftop grill restaurant that makes a choice place for pre-dinner drinks. There is a Balinese-style pool, in-room reflexology and spa massages and free WiFi. Kids under 12 eat free at the Sunday buffet that features a caricature artist, and special treats like candy floss, popcorn and candles. One of the newest and somewhat family-friendly entries on the hotel scene is the Red Lotus. 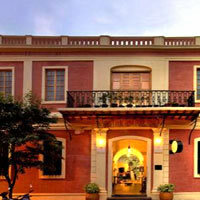 Opened in late 2013 in a restored French-Vietnamese merchant house on Nehru Street by the German/French couple Christian and Daniela, the hotel is a funky-friendly mix of themed rooms, in reasonable prices and it has a wonderful top floor terrace. It provides free WiFi and special rates for families. Plan to spent three or four relaxing days exploring the city, dining and shopping at boutiques such as those in La Maison Rose – a lovingly preserved colonial house on Romain Rolland Street with more than a faint scent of Provence. 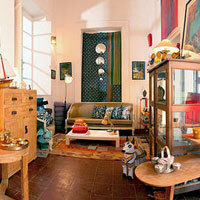 In the neighbourhood is Fabindia with a wide-range of well-designed cotton clothing, bedspreads, furniture and shoes. Also worth a visit is Hide Design for high quality leather bags, wallets and fashion accessories. For a dose of “Global India” head a block north to Ville Le Noir, the rambunctious Tamil part of town with a riot of markets, shops and Indian fast food joints. Delectable dining is available at the courtyard of Le-Dupleix Hotel, or the Hotel de l ‘Orient housed in a delightful salmon-wash mansion dating back to the 1760’s with high raftered ceilings, laundered white courtyard and colonnaded alcoves for cosy asides. Managed by the heritage-seeker Neemrana group, Hotel de l’Orient is an atmospheric getaway, mixing heritage with stylish touches for those in search of a Pondicherry boutique hotels short list. The courtyard restaurant in Villa Shanti is the reining queen of upmarket eateries in the city with good Indian and Continental choices. Kasha Ki Aasha is one of Pondi's hidden gems for breakfast and brunch. 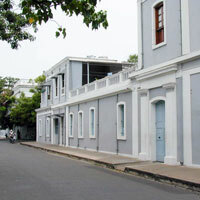 A culture fix can be had at The Alliance Française which has a library and hosts film nights; Aurodhan Art Gallery (for concerts); The French Institute (11 rue St.-Louis) for cultural evenings; The Indian National Trust for Art and Cultural Heritage which runs walking tours of the old neighbourhoods; and the Puducherry Museum. More soul-searching experiences can be discovered at the Sri Aurobindo Ashram, a spiritual community opened about a century ago by Sri Aurobindo and a French-born woman known as ‘The Mother’. The ashram’s gray and white buildings occupy about a quarter of the French Quarter and its 1,000 members focus on 'integral yoga' as the path towards a “supramental consciousness which will divinise human nature”. Visitors are free to tour the main ashram building on Marine Street and attend the evening meditation on Mondays, Tuesdays, Wednesdays and Fridays. For a less cerebral experience, head 10 kilometres north for the joys of Serenity Beach. Living up to its name, the beach is blessedly free of resorts, touts and plastic. Instead, there is a dusty fishing village and the Kallialay Surf School, (tel:  978-730-6376). Opened by two Spanish brothers raised in the nearby Auroville, part-owner Samai Juan promises to help you find your surf legs regardless of age and instructs in English, French, Spanish or Tamil. Lunch can be had at the nearby Bodhi Beach Café. A visit to the experimental utopian community of Auroville is a must. Built on a wide expanse of scrubby land, Auroville evokes the feeling of a 1960s commune that never broke up. It is home to over 2,000 people from over 40 countries who have chosen an alternative way of life where food and shelter are provided, where there are no rules, no leaders and no money. It’s a city of visionary architecture, spiritual values and industrious folk who are transforming an optimist’s vision into the world's first new-age city. If it sounds overly earnest and preachy, trust me, it isn’t. Auroville is a sprawling low-rise sparsely wooded settlement with the look of a deserted summer camp. It’s built on red dust and sand and because it’s spread out and residents are aloof, it’s difficult to get a handle on. Most visitors don’t stay long enough to discover its hidden riches. Instead they make a cursory visit the visitors centre (open daily from 9am to 5.30pm), view the exhibitions, shop at the crafts centre, watch a video and leave. Check out the many great natural food restaurants in Auroville such as Well Café, serving mean Mediterranean vegetarian or Torrants Pizzeria, an Italian eatery serving a near perfect grilled fish and oven-baked pizza. Every restaurant has a bulletin board advertising what’s happening that week in town. During the two weeks of my visit, I had a choice of a yoga massage, attending an eco-music festival, taking a course in ayurvedic massage, attending a three-day workshop in holistic healing or watching the 4th Annual Auroville Ultimate Frisbee Tournament. Chill baby, chill. The Dune, Eco Village and Spa has helped put Pondicherry on the map for the type of traveller seeking hip five-star eco-friendly luxury getaways in unlikely locales. Opened by Dimitri Klein an ex-resident of Auroville, The Dune has 55 cool thatched-roof bungalows built on a secluded beach about 30 minutes north of Pondicherry. The resort is very laid back and private and guests travel around the large grounds on bicycles. The whole experience focuses on holistic living and comfort. 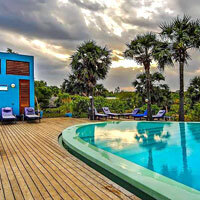 This is a great escape and must-see on our Pondicherry fun guide with boutique flavours and rustic charm. “The Dune is not just a hotel, but a way of life. We are designed for this, with our emphasis on organic living, nature and purity of mind, body and soul. Dune is an oasis of peace, a lost paradise, in a fast-paced world,” says owner Klein, a French executive who gave up the high-pressure world of advertising for an alternative lifestyle. The two restaurants serve healthy gourmet fusion food, prepared using organically farmed vegetables. 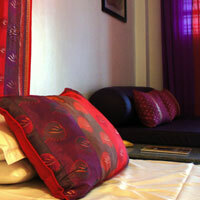 They offer ayurveda treatments, yoga and meditation as well as many alternative therapies including ‘watsu’. The hotel runs an artists’ in residence programme providing studios for artists from all around the world. Room rates will vary depending on the season. Winter (December-February) is normally the high season with the highest prices. Always check for the best available rates (BAR) online and talk with your travel agent. In general room prices may range from around Rs1,700-Rs2,500 at heritage guest houses, and Rs3,500 at quality Pondicherry boutique hotels to Rs4,000-Rs7,500 at higher end establishments. Exchange rate is approximately: US$1 = Rs66. Coloniale Guest House. Tel: [91-413] 222-4720, (e-mail: colonialheritage@rediffmail.com or www.colonialeheritage.com). Gratitude. Tel: [91-413] 222-5029, (e-mail: gratitudeheritage@yahoo.in or www.gratitudeheritage.in). Hotel de l’Orient. Tel: [[91-413] 234-3067, (hotel-de-lorient.neemranahotels.com). Hotel du Park. Tel: [91-413] 222-6591, (e-mail: reservationduparc@gmaul.com or www.hoteldupark.co.in). Le Dupleix. Tel: [91-413] 222-6999, (e-mail: ledupleix@sarovarhotels.com or www.sarovarhotels.com). Les Hibiscus. Tel: [91-413] 222-7480, (e-mail: leshibiscus@gmail.com or www.leshibiscus.in). Red Lotus. Tel: [91-413] 887-034-4334, (e-mail: redlotuspondicherry@gmail.com or www.redlotuspondicherry.com). The Dune, Eco Village and Spa. Tel: [91-413] 2655-751, (e-mail: booking@duneecogroup.com or www.duneecogroup.com). The French Villa. Tel: [91-413] 420-1545, (e-mail: booking@thefrenchvilla.in or www.thefrenchvilla.in). The Promenade. Tel: [91-413] -222-7750, (e-mail: promenade@sarovarhotels.com or www.sarovarhotels.com). Villa Shanti. [91-413] 420-0028, (e-mail: reservation@lavillashanti.com or www.lavillashanti.com). Bodhi Beach Café. Tel: [91-413] 994-453-7666, (www.facebook.com/pages/BODHI-BEACH). Kasha Ki Aasha. Tel: [91-413] 222-2963, (www.facebook.com/pages/Kasha-Ki-Aasha). La Maison Rose Restaurant. Tel: [91-413] 421-0806, (www.lamaisonrosepondicherry.com). Restaurant La Terrasse. Tel [91-413] 958-504-1430. Tanto Pizzeria. Tel: [91-413] 262-2368, (www.facebook.com/pages/Tanto-pizzeria). Well Café. Tel: [91-413] 262-2219, (www.facebook.com/pages/Well-cafe). Aurodhan Art Gallery. Tel: [91-413] 222-2795, (www.aurodhan.com). Auroville Visitors' Centre. Tel: [91-413] 262-2239, (www.auroville.org). Fabindia. Tel: [91-413] 222-6010, (www.fabindia.com). Hide Design. Tel: [91-413] 222-9944, (www.hidesign.com). 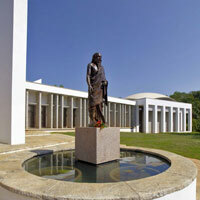 The Indian National Trust for Art and Cultural Heritage. Tel: [91-413] 222-5991, (www.intachpondicherry.com). The Kallialay Surf School. Tel: [91-413] 9787-306-376, (www.surfschoolindia.com). Puducherry Museum. Tel: [91-413] 233-9497, (e-mail: tourism.pon@nic.in). Sri Aurobindo Ashram. Tel: [91-413] 223-3604, (www.sriaurobindoashram.org).